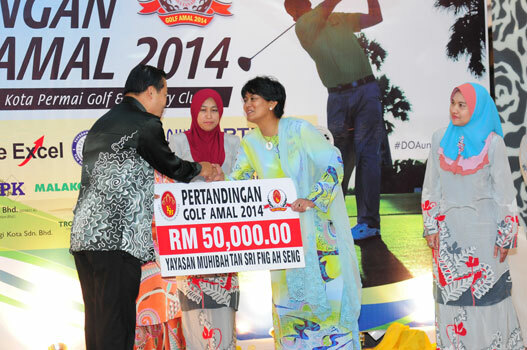 Shah Alam, 10 April 2014: The Yayasan Sultanah Bahiyah Charity Golf 2014 held at Kota Permai Golf & Country Club on 10th April successfully raised RM900,000 for the foundation's community projects in Kedah. The event was graced by the presence of His Majesty The King Tuanku Abdul Halim Mua'adzam Shah and Her Majesty The Queen Tuanku Haminah Hamidun, the Tuanku Ampuan Besar of Negeri Sembilan Tuanku Aishah Rohani, members of the Kedah and other Royal families, and various dignitaries 120 golfers took art and were treated to a superb golfing conditions on Kota Permai's award-winning golf course. Tan Sri Tunku Puteri Intan Safinaz receiving contribution from representative of Weststar Group of Companies. Chairman of the foundation's board of trustees Tan Sri Tunku Puteri Intan Safinaz noted in her speech that the foundation spends more than RM2 million each year towards numerous health and community programmes in Kedah, such as its core project Titian Bestari which provides free tuition to needy children in rural areas. Funds from this year's event will also be channelled to the foundation's other initiatives which include a mobile health service, mobile blood bank and haemodialysis centres in collaboration with the National Kidney Foundation. Tan Sri Tunku Puteri Intan Safinaz receiving contribution from representative of Yayasan Muhibah Tan Sri Fng Ah Seng. 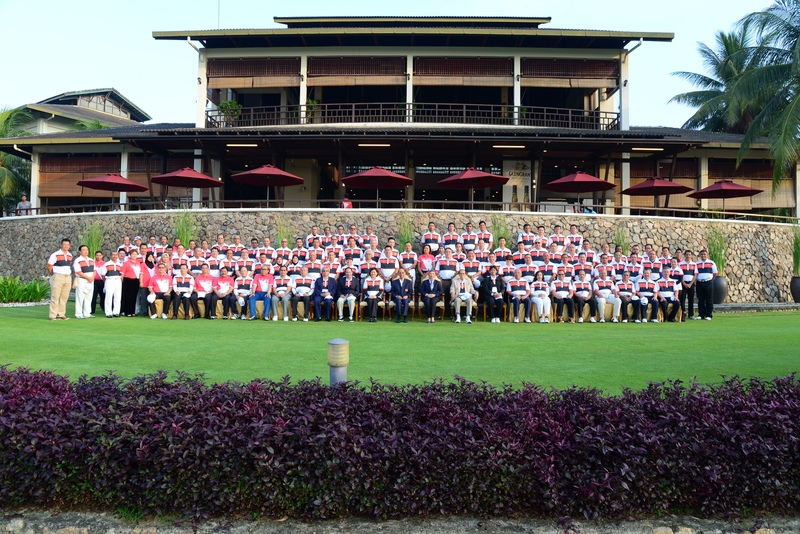 Recognising the tragic mystery of Flight MH370's disappearance, the event saw 'Pray for MH370' printed on the backdrop and even on the sleeve of the participant's golf shirts. Tunku Puteri Intan made an emotional mention towards the end of her speech on keeping the missing airliner's passengers and crews, as well as their families in everyone's thoughts and prayers. The main sponsor of the event was Weststar while other sponsors included MMC-Gamuda, Tone Excel, Paramount Property and Optimax Eye Specialist. The main prize of a seven-day golfing trip to Turkey was sponsored by Turkish Airlines and Apple Vacations. Men Champion, Nor Afsham B. Mohd Nasir receiving his prize from His Majesty The King Tuanku Abdul Halim Mua'adzam Shah and Tan Sri Tunku Puteri Intan Safinaz.